You are here: Home / Tutorials / How to Backup and Restore a XenForo Forum Using Shell SSH Access? Shell SSH access to the server is recommended for backups. Use Putty for windows and Terminal for Mac to execute the backup commands. Often shell SSH access is disabled on shared hosting and you may need to enable it. Once you are logged into the SSH, change the directory with CD command to public_html directory. If you aren’t sure the exact path to your public_html directory, upload a temp.php file with following. Now run the file in a browser and it will show the path to the public_html directory. As a security tip, it isn’t recommended to have the temp.php file on the web server. Backup MySQL database using mysqldump command. Replace USERNAME and PASSWORD with your own info. Zip the backup SQL file created. Now create a tar file of all the files inside the public_html folder. dbase.sql.gz which contains the database backup. The full backup of XenForo is complete. The above files can be saved to a remote FTP server using the FTP commands which can save you the pain to download large files. 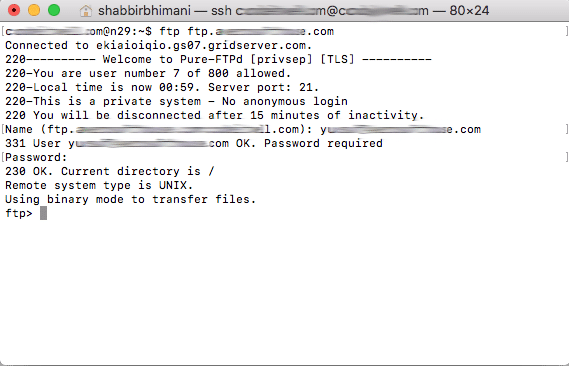 And then it prompts for username and password for the remote FTP connection. Now at the FTP command prompt one can do a put command to transfer the backup files to the FTP server. Depending on the size of the backup files, it may take some time for each of the above commands to complete. Once complete, you will have both the files transferred over to the other server. If you wish to create folders to keep the backup files, you can do that using these basic FTP commands. Restoring the files and database from the above files is simple. Unzip the database file. Now change the database using the following MySQL command. If you do not have the database created, you can do so using this guide. Now use the source command to restore the backup in the database. The process will start executing the SQL commands from the file. Depending on the size of the backup, the process can take a long time. Once complete exit the MySQL prompt with exit command. Now move files.tar.gz into the public_html folder. Again if you aren’t sure of the path to public_html, you can use the temp.php file in the backup step to get the path to the public_html folder. Edit the config.php file to connect the new database.